The Challengair® Airmax® produces warm, high velocity air under pressure to make your animal grooming tasks easier. The Challengair® Airmax® has two brush‑type motors and comes in two‑speed or variable speed models. One motor supercharges the other, or use just one for air volume and temperature versatility. The powerful motors reduce drying time as high velocity air penetrates even the thickest undercoats. The Challengair® Airmax® produces heat by a “flow‑thru” motor system that warms air as it cools the motors for optimum effectiveness and energy savings. The noise deadening, high impact, service friendly “clamshell” housing is made of molded silicone with sound isolating motor mounts. This results in exceptional quietness. The housing is virtually indestructible and will not rust, dent or crack. Includes convenient “push‑on” hose with Double K's Airgonomic™ Nozzle System: nozzle and nozzle tips designed for easy switching and cool‑to‑the‑touch design. The unique Airgonomic™ “air sweep nozzle” is designed to blow water off animals' coats in sheets. 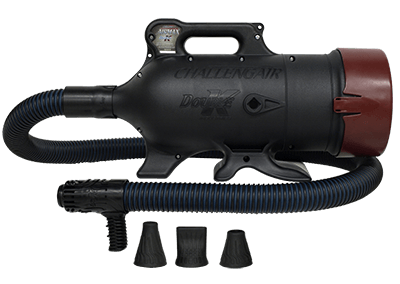 The Challengair® Airmax® has dual air filtration that protects motors and shop air quality. Hoses are crushproof and heat resistant. The variable speed model with its solid‑state variable speed control allows versatile temperature, volume and velocity adjustments. 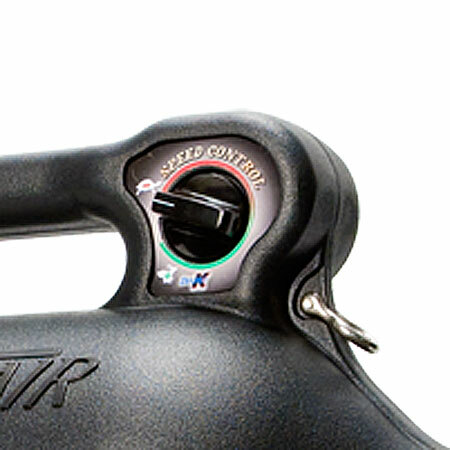 The Challengair® Airmax® two speed model has two temperatures. Two Powerful Motors - 123 cubic feet per minute per motor = 246 cubic feet per minute total. The Challengair® Airmax® dryer produces more air due to the aerodynamic housing design and a smooth hose lining, reducing resistance as air moves through the hose, thereby increasing air volume (and velocity). The Challengair® Airmax® is designed to provide long, reliable service and will retain its beauty much longer than metal dryers. The Challengair® Airmax® is less expensive than comparable dryers, offering you better value. Comes with a two year limited warranty which includes hoses and nozzles. 30 day purchase money back satisfaction guarantee. Variable Speed model information: The variable speed Airmax® allows for complete control of the air volume and velocity. You get full high speed down to a very low speed, and everything in between. The dial control means more flexibility in grooming with the ability to cater the air flow to the animal and your grooming needs. Choose full power for large full coated animals, moderate speeds for ears and drying sensitive areas or medium coated breeds and low air volume for small animals, cats or young/sensitive animals. IMPORTANT: Do not use variable control with a power inverter system. Variable speed: Available in 115 volt. 230 volt coming soon. 2‑speed: Available in 115 and 230 volt.